7 Signs Someone Is Trying to Psychologically Manipulate You! Home » Health » truth » 7 Signs Someone Is Trying to Psychologically Manipulate You! People who manipulate others are among the most self-centered people out there. They serve their own interests, and often at the expense of an innocent victim. Methods employed by manipulators can be characterized as abusive, deceptive, devious, and exploitative. Though their actions are most certainly malicious, manipulators are often both crafty and intelligent. The act of manipulation involves deliberate and complex thought processes; something that can only be achieved by a person that leverages human psychology to their advantage. Psychological manipulation is a type of social influence that aims to change the behavior or perception of others through abusive, deceptive, or underhanded tactics. – Harriet Braiker, author of Who’s Pulling Your Strings? (1) Concealing aggressive behaviors and intentions. (2) Understanding the psychological shortcomings of a victim in determining which method will best achieve desired results. (3) An uncommon degree of ruthlessness; having no apprehension about inflicting harm upon an unknowing victim. This first tactic is one that many salespeople utilize – and it’s often quite useful; just as a salesman will use “prospecting” to “baseline” your thinking and behavior, manipulators will as well. This is a means of attempting to evaluate any perceived strengths or weaknesses, the latter will be used to give them some kind of “edge” in their manipulative tactics. A manipulator may do this repeatedly, which opens up an opportunity for you to “turn the tables.” Should you suspect an ulterior motive (or are just uncomfortable), refuse to engage in conversation if or when they prove otherwise. Like some textbook narcissists, smart manipulators will overwhelm you with alleged “facts” (e.g. statistics, data, events) that you may know little about. Similar behavior can happen in sales and other business-related discussions, as well. Unlike a knowledgeable salesperson, however, a manipulator uses this tactic exclusively for their own gain. They’ll make every attempt to establish credibility through their “expert knowledge,” hoping that they’ll be able to control the situation at their will. If you’re in this situation, it’s a good idea to use your best judgment or simply walk away. Some manipulators may raise their voice while taking when trying to aggressively manipulate someone. Manipulators that engage in this behavior are seeking to get someone to conform to their demands – an ordinary coercion technique for the combative schemer. When in this situation, it’s best to remain level headed, walk away, or simply “say no” any demands. Someone that is insecure is often a target for manipulators, as insecurity is perceived as a severe weakness by these liars and deceivers. Manipulators will try different ways of creating a sense of insecurity or inferiority, such as negative humor and sarcasm. They’ll often poke fun at your appearance, work habits, and even your personal life. If you can manage to resist punching their smug face, that’s step one. Step two is to (confidently) make it clear that this type of talk is unacceptable and unwanted. Or, of course, just get out of there ASAP. Professing ignorance is a secret weapon in a manipulator’s arsenal. This is a tactic commonly seen in the workplace, where the con-artist will insist on “playing” dumb – a passive-aggressive technique used to hide something or avoid an obligation. This is similar to how a child will profess inability to get an adult to do something for them they don’t want to do. Sadly, some “adults” do this as well. 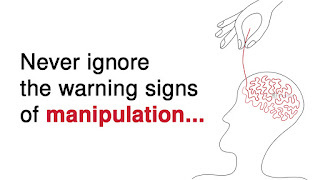 Manipulators are, most often, compulsive and pathological liars. It’s no surprise, then, that they’ll twist the truth in an attempt to gain some type of leverage.They’ll blame innocent people, display biases, exaggerate, “forget” important information, make excuses, etc., etc. This is perhaps a manipulator’s primary weakness. Even the most shrewd schemer is prone to telling a fib that is found out. Aside from us respecting their basic humanity, manipulators deserve nothing. Compulsive and pathological liars deserve nothing. As such, you are under no obligation to stand idly by while such people spoon-feed you lies. Manipulators will apply an excessive amount of pressure on someone in an attempt to get them to make a decision before they’re ready. They’ll often create a false sense of urgency in trying to raise the level of tension. Of course, this is all a sham – a theatrical display with an underlying motive, which is to suppress the victim’s decision-making ability and seize control. Walk away, run away, or jog slowly in the opposite direction. Refuse to play this type of game. BRAIKER, H. (2003). WHO’S PULLING YOUR STRINGS? : HOW TO BREAK THE CYCLE OF MANIPULATION AND REGAIN CONTROL OF YOUR LIFE. MCGRAW HILL PROFESSIONAL. SIMON, G. K. (1996). IN SHEEP’S CLOTHING: UNDERSTANDING AND DEALING WITH MANIPULATIVE PEOPLE. PARKHURST BROTHERS INC. This article was republished from powerofpositivity.com. You can find the original post here.